Nothing like that, on her. Going to the attorney again tomorrow, will get more info. My wife's conviction, is on the federal level, and she plead guilty. At least, that's what she told me. I never saw the inside of a court room, after her arrest. That data can be found on line. I am following a case with the wife's old "room mate" She was ordered released in 12/16 then they found the wrong paper work was filed by her attorney. It went to the supremes 5/2/17. Waiting on their ruling. She was a bad person (more than once) wifey has only been in trouble once. She didn't know how the system worked. She got hosed bad. I would like Hillary Clinton's​ head in a jar for a collection. Is one of those Taurus's a .40? And what are the makes of the revolvers? 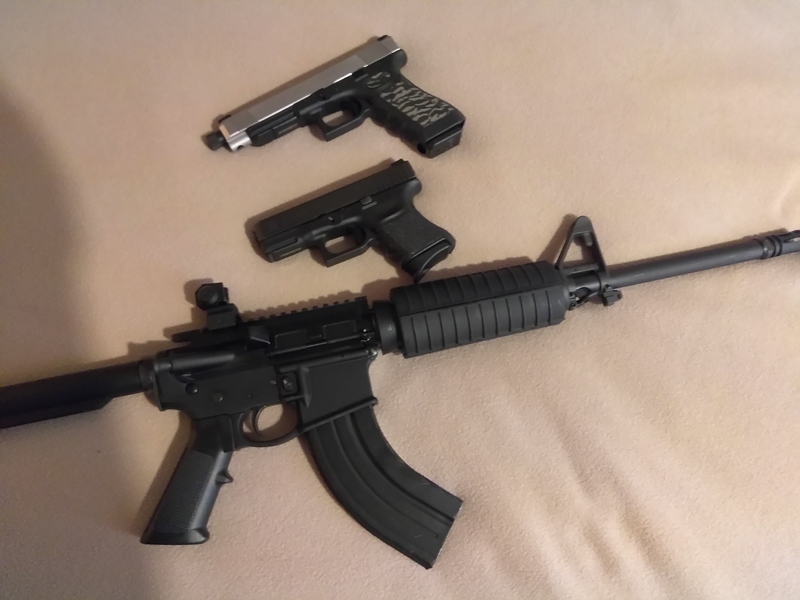 Auto's-Taurus PT111 9mm G2 Millennium - S&W M&P 40 Sheild - Taurus PT140 40 G2 Millennium. Last edited by ifithitu; 05-17-2017 at 10:53 PM. I bet that 40 is a handfull! Truth i've had it about three years now,but i haven't fired it that much because I don't take the same pistol or revolver to the range all the time. I've put about 100 rounds through it, no problems with that amount. Glock G30, G36SF, G21, Colt King Cobra 357, AR15, A 1951 Savage Model 99 .243 lever action, Wather P380 (for the wife and sometimes my secondary), A .338 Win Mag, Savage .204, Rugar 10 22 and a Remington 597. Looking to add more as soon as my child support payments end in June!!! WWWWOOOOOOTTTTT WWWWWOOOOOTTTT!! !